After an amazing yoga class I was craving something hearty and healthy on this cold February day. I stopped at Wegman’s and grabbed a rotisserie chicken and a bag of stew veggies and headed home. The rest of the ingredients I had in my pantry and decided to throw in there to make a delicious and EASY soup. The soup took about 30 minutes to make and now I have a yummy lunch option for this week. I hope all of you are enjoying your Sunday- cheers! 1 40 oz packet of stew vegetables (if you don’t have a Wegman’s nearby the bag contains a total of 10 cups of potatoes, carrots, onions and celery) Dice the veggies to a smaller size! 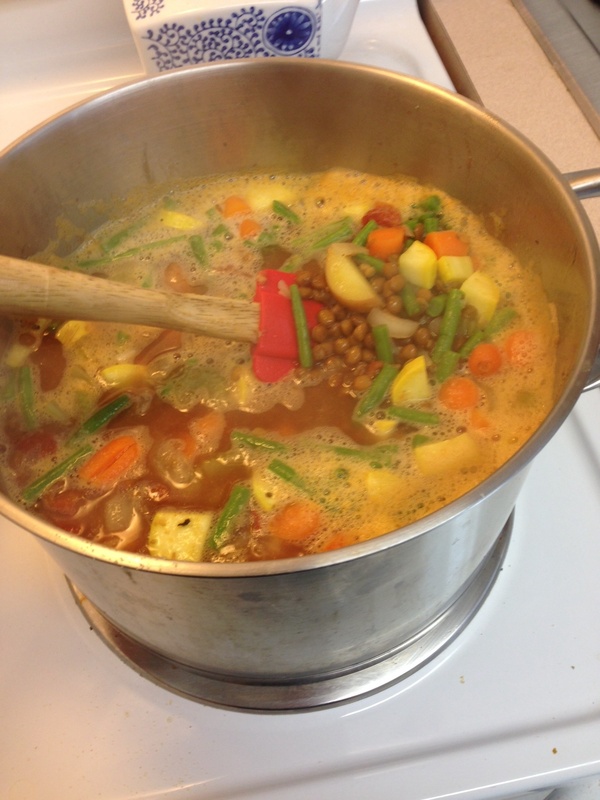 Start by pouring the chicken or veggie broth into a large pot, add the diced veggies (potatoes, carrots, onions and celery), add the tomatoes, lentils, garlic, zucchini. Keep heat at medium/high. Add the garlic powder and salt, salt and pepper and cover turn heat to medium/low and let cook for 20 minutes. If you would like to add chicken to the dish, prepare that now. I used a rotisserie chicken, took the skin off and diced the white meat into smaller chunks. Add the chicken after the 20 minutes is up and uncover, continue cooking on low for 15-20 more minutes.